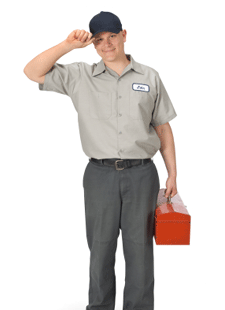 If you are making the switch from PEX to GTPEX there are some things that you should know. The first thing is that the GTPEX Pipes are constructed with a high-density polyethylene or HDPE. This construction makes this PEX better and stronger than other different PEX products. There are also some very distinctive advantages of using this type of PEX. One of them is that by using GTPEX is that it will greatly decrease the cost of materials as well as reduce the amount of time it takes to install this special system. This type of PEX is 100% rustproof on both the inside of the pipe and the outside of the piping. This PEX is very lightweight and can be transported with ease to the jobsite. You will only need tow tools to install this GTPEX and they are the PEX Cutter and the Crimping Tool and both are available from the company, GTGlobe. These pipes were designed to handle pressure up to 24 bars or 348 psi. The temperature ranges on this PEX is up to 203 degrees Fahrenheit but it can stand up to 230 degrees Fahrenheit. All of the GTPEX products are all manufactured with NSF, ASTM and the CSA. All of the GTPEX Piping is ISO Certified and meets all of the very strict requirements such as safety and quality. There are some great products here at GTGlobe; some of the featured products are the GTPEX-R Radiant PEX, Thermoflex High Performance Foam Insulated PEX Pipes, the GTFIT High Quality Brass PEX Fittings and the GTFLOW PEX Manifolds. Let’s take a look at each product and see what it has to offer. The GTPEX-R is constructed with an oxygen barrier that is used most commonly in radiant heating. This technology offers a sub floor or concrete installation that runs in an S pattern. The pattern becomes effective as the hot water is controlled through the PEX Pipe System for a better heating system. Some of the perks of using this type of PEX is that it is Comfortable, when used on radiant heating the GTPEX-R can provide a nice temperature that will heat the entire room without cold spots. Another great reason why the GTPEX-R is a good choice is that it is cost effective when used with low temperatures. This can greatly reduce your home energy bills. Plus with the GTPEX-R System you won’t have any hot air accumulates at the ceiling level, which will also provide a more energy efficient heating system. This system is extremely flexible and is easy to handle as the installer does the installation. There is very little mess and accuracy is key. In addition to being a great choice for your radiant heating system is that it is 100% safe. You won’t have to worry about any pipes bursting in the colder winter months. This piping is available in sizes 3/8″, 1/2″, 5/8″, 3/4″ and 1″. 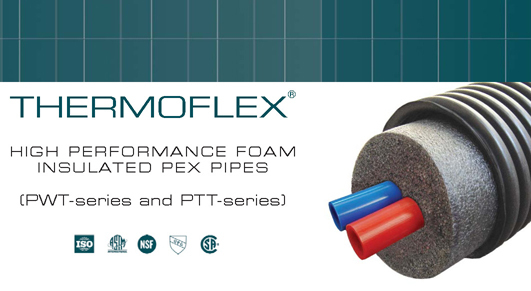 Another great types of PEX are Thermoflex High Performance PEX. This style of PEX is recommended to be used for high performance applications. Some of these special applications for Thermoflex for a hot water to travel from the heating source to the radiant heating system. It can also be used on the cold water transport system. This system works in the colder weather to help eliminate the freezing of the pipes. Then we have the cold water transport to the hot water transport. This system will stop the drinking water from becoming too warm and it can maintain the perfect temperature. The Thermoflex is constructed with a virgin plastic corrugated tile pipe that will prevent the environmental water become contaminated with other chemicals. Since the system is made with a 2-pipe support system which consist of the supply and return it can either increase or decrease the amount of pipes that are used. 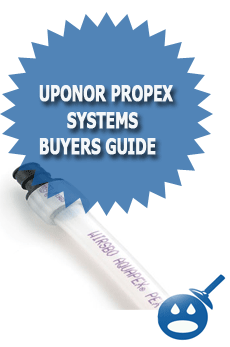 If you are using this PEX for a Potable Water System that does not include an Oxygen Barrier. Then this style is available in Red and Blue and available in 1″. The coil length is available in 100, 200 and 250 feet. If you are planning on using the Thermoflex for heating system the there is Red on Red available in 1″ diameter and 100, 200 and 250 feet in length. One of the premier sellers in the GTGlobe PEX Product Line is the GTFIT. These are high quality and high performance brass fittings that can accommodate all of your installation requirements. There are many different models and dimensions such as the 1/2″, 3/4″, 3/8″, 5/8″, 1″ and the 1-1/4″. These PEX Fittings are all 100% certified and they are all quality controlled. These fittings can offer you the very best for all different styles of plumbing systems. If you don’t see a fitting that you need, simply contact the company and they may be able to customize and option that will help you meet all of the requirements to get the installation done properly. You will find the Copper Crimp, Stainless Steel Cinch Clamp, End Cap, Tee, Elbow much more. You will find everything you need and more at GTGlobe. Without the fittings the installation can’t get done, so take a complete inventory of what you need and contact your local representative to get what you need. Some of the features of the GTFlow Manifolds is that they come with all of the accessories needed to get your job done. The GTFlow System is constructed with a high quality brass that comes in either 5 o 10 loop configurations. You will find with the GTFlow PEX Manifold you will get a balanced flow in each port that uses port valves and flow meters. The temperature gauges on the supply and on the return side. They come with air bleed valves, drain valves as well as 3/4″ MTP ports with a 1″ FTP Supply. Some of the benefits of this type of PEX is that you will get an accurate loop balancing with temperature gauging. You will also get a reliable system complete with o-ring seals. The system is expandable and has a high capacity for water flow rates. There are some different parts that make up the kit and they include the PEX Male Threaded Adapter, Compression Fittings, Manifold Port Cap, Manifold Core Connectors, Metric Converters and the Manifold Kit. These parts are available in many different sizes. All of the GTGlobe Products are all certified, the manufacturers of these products keep a strict guideline of requirements and certifications such as the ASTM, which stands for the American Society for Testing and Materials and the NSF (National Sanitation Foundation). All products are made with the UPC or Uniformed Plumbing Code. Each product has a 25 year limited warranty. For example the GTPEX and the GTPEX-R are all covered for 25 years from the date of purchase and this warranty will cover any defects on the materials under normal wear and tear. It is important to make sure that your installer is properly certified to do the installation, if the materials are installed wrong the warranty will not cover them. If you are considering switching over to Radiant Heating, PEX is the best way to save money on the installation, materials and on your monthly heating costs. There are some great products out there but GTGlobe has a full and complete line of PEX products that are cost effective as well as beneficial for your home. Consider using GTGlobe PEX products that have a great warranty and a great reputation. Contact the company or check out their website and see how much these PEX products can benefit you and your home. Do some shopping around and then contact the company and speak to a sales representative and see how they can help you connect with the materials you need in addition to the locating a certified GTPEX installer. « What Is Delta Touch2O Technology?